The largest dish antenna in the world is of course the one at Arecibo: a valley between hills in which a dish antenna with a diameter of 300 m has been built (although in China a similar antenna of 500 m is being constructed). But did you know that there has been a similar antenna in the Netherlands, albeit of a smaller size? 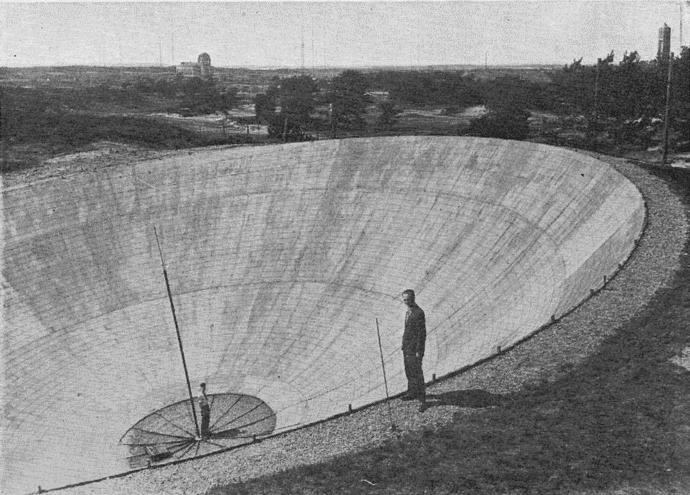 In the early 1950s, radio astronomy was done at Radio Kootwijk, mostly using a number of WW2-surplus 7.5 m diameter Würzburg dishes. These have been used among others to detect the 21 cm hydrogen radiation from space and chart it for the first time. 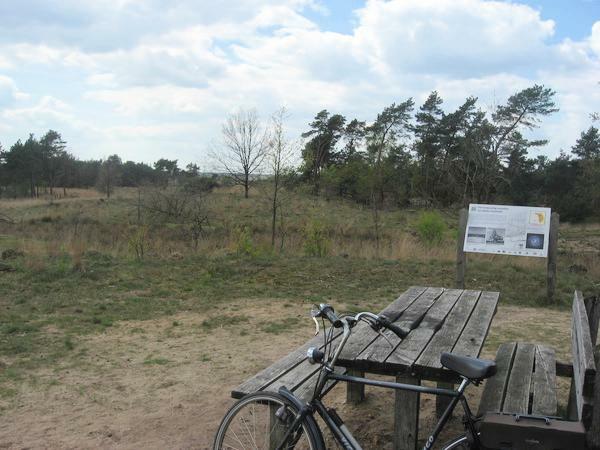 All of this while awaiting the construction of the 25 m radio telescope at Dwingeloo, which was inaugurated in 1956. Besides that, in 1951 a parabolic dish was built in a suitable valley using concrete with chicken wire on top to make it reflecting . Its diameter was 30 m and its focal length 7.5 m. The dish was not pointed vertically up, but had a 10.5 degree angle to south. This angle was chosen such that in the course of the day, due to the earth's rotation around its axis, two important astronomical objects passed through its beam: Cygnus A, one of the strongest radio sources in the sky, and the Andromeda nebula. The main purpose of this dish seems to have been measuring the influence of the ionosphere on radio signals. That influence is stronger at larger wavelengths; they wanted to measure at wavelengths of 6 meters, and there a 7.5 m Würzburg dish is not very effective anymore. Hence the need for a bigger dish. Besides that, according to  a receiver for 21 cm was being constructed. But in the end this dish seems to have resulted in few scientific results; no publications can be found except some preliminary plots in . When I asked him recently, prof. Hugo van Woerden (the man at the edge of the dish as pictured) confirmed this; according to him, it was mostly due to a lack of manpower to really use the dish. Later the parabola has been used by the local youth as a playground, like riding around in it on a bicycle , before being filled and later cleared away. Now the only reminder at the site is an information sign, installed in 2011. B.t.w., there is an important technical difference between this dish and Arecibo. The Kootwijk dish was parabola-shaped, and thus had a well-defined focal point. In constrast, the Arecibo dish has the shape of part of a sphere. As a consequence, it has no well-defined focal point, and a special feed is need to optimally "illuminate" the dish. The advantage however is that by moving the feed, the beam can be steered, up to 20 degrees away from straight up, without defocussing the beam. A.H. de Voogt: Radiosterrenkunde in ons land - de aard van het onderzoek en enkele uitkomsten. Hemel en Dampkring, 1952. Cees van der Pluijm: Radio Kootwijk - Biografie van een zendstation en een dorp in het hart van de Veluwe. 2014. Text and pictures on this page are copyright 2016, P.T. de Boer, pa3fwm@amsat.org .